Over the last several years, a great deal of attention has been paid to the phenomenon of Global Warming, of its causes, of the (sometimes) dire predictions of its probable eventual measurable long-range effects, and of various methods by which humanity may avoid catastrophe. Of the many large scale problems facing humanity, in terms of its probable limits to growth, we may count the natural limitations of sustenance: Limitation of water, limitation of food, limitation of habitable land-mass, limitation of sources of energy. For two centuries, people have argued about the cautionary theories of Thomas Robert Malthus [1766-1834], as espoused in Essay on the Principle of Population [1798 and subsequent editions]. 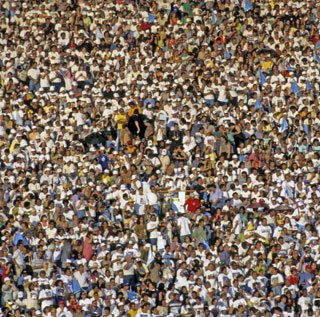 Malthus's basic tenets are: That there is a tendency towards a constant increase in population; and that the rate of increase of population is far greater, by a geometric factor, than the capacity of humankind to increase the rate of supply itself with adequate sustenance. Malthus went further, claiming that poverty, disease and other kinds of social distress were directly attributable to this paradigm, and that only through the efficient reduction in populations--either through catastrophes such as wars, plagues, mass starvation--or through more peaceful, voluntary means of limitation, was a natural balance achieved between population and environment. Malthus could not have foreseen various future developments---scientific agriculture, fossil fuel (petroleum), atomic energy, Darwinian theory, and so forth--but it's certainly safe to say that, with minor augmentations, his theoretical predictions regarding the effects of overpopulation have nearly all been proven true. The modern industrial paradigm, with its emphasis on constant growth, both of (industrial) production, and of rapid population expansion, is a construct virtually guaranteed to produce the unfortunate consequences first postulated by Malthus. The consequences of the rapid expansion of the means of production have had another unforeseen effect. Thinkers of the late 18th and early 19th Centuries could not have imagined that the unrestrained use of fossil fuel energy would lead to a catastrophic change in the mean temperature of the globe, with serious, perhaps irreversible, secondary effects. The contemporary model of constant expansion is based on a continuously increasing population of consumers, balanced by a continuously increasing machine of production. The problem of Global Warming can be seen, now, as an inevitable result of our misguided faith in the growth paradigm. Both factors--over-exploitation of resource (with its attendant evil of pollution), and excessive, unchecked population growth--are leading us towards a major world-wide catastrophe, perhaps of Biblical proportions. Until we are willing to address the riddle of population growth, and of mankind's selfish tendency to exploit the earth to feed that growth, most of the world's problems will not be solved. It's the elephant in the room which no one acknowledges. We would do well to heed that warning. On Fox News there is a continual chortling about global warming, as if it's something that Al Gore invented, like the Internet. Hannity is especially gung ho about ridiculing global warming, saying that Gore himself with his enormous carbon footprint from running about with his jet yakking about global warming is perhaps the biggest contributor. On a more sober scale, there is a Danish statistician named Lomberg, who argues that global warming is statistically insignificant, and is as likely to be caused by a flux in the sun as by anything people are doing. Lomberg goes further (this has been in more recent articles that can't be found in his text The Environmental Skeptic), where he argues that global warming will save half a million lives a year because that many deaths are causing by freezing every year. The Unabomber also warned that as we continue to crowd the globe and increasingly depend on technology we are heading toward a catastrophic breakdown that he intended to stop by maiming individual scientists. I can't tell what to think about this. On the one hand, there is the problem that in the Bible, God says that we should go forth and multiply. But the planet is not infinite, and its resources are clearly finite. So let's say that the description of the problem is accurate and that resources are finite and as we multiply we ultimately will hit a zenith from which the quality of life begins to disastrously cave in, if not from actual birth population then from people from crummy Catholic countries like Mexico overpopulating and then sending their surplus population to America with maps and guides in terms of how to settle in. The Chinese have opted for financial inducements and punishments for anyone having more than one child. Segments of the Republican party argued that we should have a very good wall against Mexico, and also punishments for employers who hire illegals. Democrats on the other hand want that voting constituency. They want abortion to be legal, but they want to legalize illegal immigration, in order to get the Hispanic vote. I think your mathematical description of an exploding population is probably accurate. When then is the prescription? Should there be a lottery in which the losers have to commit suicide? Should there be a no-growth policy and those who go over it have to pay extra fees for each child over 1? Or do we just let nature take care of it, so that when we hit the wall of supply and demand, and supply cannot meet the demand, famine kicks in and those who cannot afford to eat whatever's left to eat croak from starvation? I would like a very good wall, strong punishments for illegal immigration. I also think it's a good idea to limit families to four or five children (max) and anyone who goes over that limit has to pay a fee of say ten thousand dollars per head to the department of transportation or something. It's harder to think of prescriptions. But ultimately nature will take care of this issue. Soylent Green is another possibility that perhaps Malthus didn't think out: but cannibalism via lottery of some kind wouldn't be healthy. Wouldn't it lead to some kind of mad cow ultimately? In addressing the question of population, one has to limit the parameters of debate. The world is not yet united, either politically, or in any other sense. The United Nations is a failed entity, though I for one wouldn't advocate doing away with it. The possibility of cooperation is always more attractive than the alternative. As a citizen of a nation, one then asks what one can do to address the problem of overpopulation. Gary Snyder, a literary eco-activist whose views I admire, believes that responsibility to land and society begins at home. Irresponsible behavior leads inevitably to problems. No couple should ever, under our present circumstances, think of having more than 3 children. We should not overpopulate those lands over which we have political control. This means land use policies and zoning rules that dictate limits on how many bodies an area can comfortably accommodate. These are quality of life issues, but in some parts of the world they are literally matters OF life and death. Los Angeles, for instance, is an enormous anomaly. It is largely without resource, lacking water, or sufficient arable land to sustain a large population. Yet it continues to grow. Who's watching the store? If we define the extent of our control and responsibility to states, or nations, we have a right and a duty to preserve that which we possess, lest it be taken away from us, or overrun by refugees from other nations that are in political, economic or social disarray. If we can't, we're just sliding helplessly into perdition. We are citizens of the world, but prudence and stewardship begins at home. If our own nation is hurting, if we're despoiling our environment, allowing our cities to mushroom out of control, we won't be in a position to assist other nations, other peoples. No nation that does not keep its own house in order, can be "rich enough" to waste its own reserves in the interests of "saving" irresponsible neighbors. This is cultivated selfishness on a grand scale. Based on the possibility of the desirability of the improvement of man and of the quality of life. I have four children. Does Gary Snyder suggest a penalty? He's so Maoist it's hilarious, even down to family planning. I wouldn't disagree about Snyder's Marxist affiliations. Early on in his career, he plucked a few pertinent principles from socialistic dogma, and incorporated them into his poetics. I don't think he's ever expressed himself on state-enforced family planning. But I fail to see how the micro-application of responsibility to land, hearth, family and immediate region qualifies as specifically socialistic. Socialism in its 20th Century forms was a top-down affair, with regulations regarding everything. Please note I expressed the need for personal responsibility, not regulation. This isn't socialism. Responsible parents don't have more children than they can comfortably attend to, support, and teach. In addition, one has a responsibility to the community. Shoving six kids into the welfare system, the school system, and the prison system isn't responsible behavior. Kirby, I think if you ever begin to look seriously at resource and land use, you'll eventually come around to a more (w)holistic view of life. Humans aren't living on a foreign planet, we weren't deposited here by aliens, we're just dust. Well, I never said we were deposited here by aliens, did I? Is there someone who believes that? But dust doesn't have any right and can't replicate, and is just a nuisance. Are you sure you think that we're just dust? If we are, why worry about us? If we're dust then we SHOULD be removed. Somehow I don't think this is what you meant. humankind is OF this planet, we are merely a variation of the mammalian form, of all life which derives from the fortunate coincidence of elements to make animate, conscious individuals. God's variety, if you will. So in the very real sense, on the material level, we are all the STUFF of that upon which we subsist. Humans aren't separate, discrete entities put here by a higher power, we're an integral part of a whole system, the highest expression of life so far descended from the line of beings millions of years back. We can't conquer nature; it is us. We can't ignore our dependence upon it, its health, our own connection to it. Malthus simply reminds us of the continuing reality of our connection, and of the limitations inherent in our continued presence on the planet. Death is a completely natural process and occurrence in the sequence of the continuation of species on the planet. But if we would improve ("perfect") our lives, we would prefer that death not be painful, unexpected, swift, or wholesale. Living in health, in peace, with longevity and inspiration can't be achieved if we ignore the fundamental axioms of life, starting with our knowledge of body, its sustenance, the sources of our prevalence. Faulkner says in his Nobel Speech that man will not "merely prevail" but we need to prevail first, before we can address the other stuff. Our actions over the last 150 years bring into serious question our expectations to prevail. Advanced physicists now seem to be telling us that all matter is, in essence, light. So that everything we think of as having substance, matter, "stuff", is nothing more or less than LIGHT. It's an amazing idea--that our bodies, our consciousness is simply the arrangement of rays of light in various configurations, organized and funcntioning as elaborations of minute sub-atomic waves. We may be dust, but that dust is really light. Advanced physicists are often wrong, and change their minds on a weekly basis. Don't take them too seriously. They are always trying to reduce everything to one thing. They were trying to do this with Anaximander and Thales. People are irreducible to dust or light. But obviously the continuity with nature exists. But we are also something else, too. No other animal can use the internet, for instance. No other creature can put ideas into this bi-coastal platform, or discuss ideals. Light doesn't need to eat. We do. Light doesn't have children. We do. Physicists are just a bunch of nerds. go and meet them. They just look at their shoes. They have no feelings. We have seen them, Kirb, and they are us!